From next weekend air travellers will be given the equivalent of a £5 bung, courtesy of the taxpayer, to use Newquay airport in Cornwall for four flights a day both ways to Heathrow. The article describes how the service is run under a Public Aervice Obligation or PSO. Other air services in the UK run on this basis include. Similar subsidies are used in the EU and the United States. 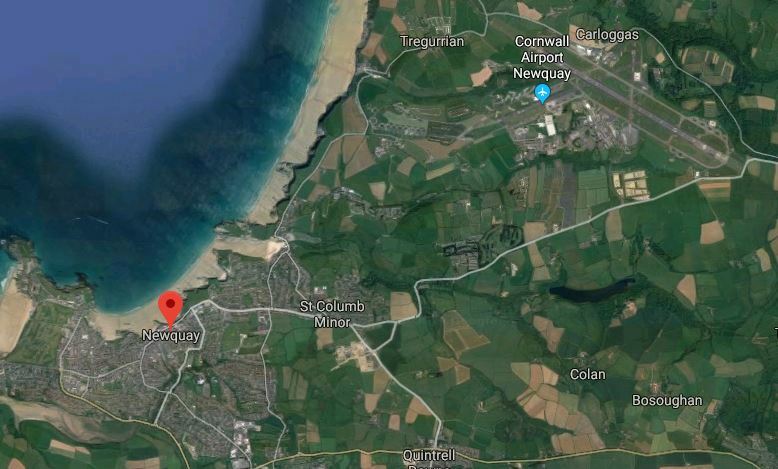 This Google Map shows Newquay (indicated by a red marker,and the airport. The town and the airport are about 4.3 miles apart. 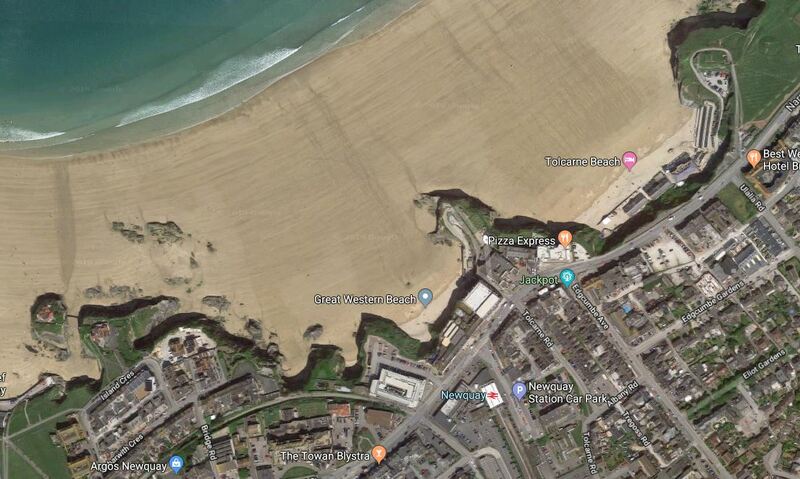 This Google Map shows the centre of Newquay. Note Newquay station in the middle of the town close to the beach. How rare to see a coastal town with a well-placed station. It does seem that in the Summer, there are more than just a rudimentary local service to the town. In the Summer, there are also long distance services, to London, Manchester and Scotland. I also think, that GWR might run one of their shortened HSTs to the town from perhaps Exeter with upmarket service on board. So I have to ask, the question, if the a subsidy for the air service is really necessary? All srvices to Oxford and Bedwyn, which have been run by slow diesels for years, will soon be run by 125 mph Class 800 trains, so they can join the herds of high-speed services on the dash using the fast lines between Reading and Paddington stations. All slower passenger trains between Paddington and Reading, will use the slow lines. Most will be Crossrail services and freight trains. ,Heathrow Express services, which will be four tph and run by upgraded 110 mph Class 387 trains, will use the fast lines between Paddington and Stockley Junction. Some Class 800 trains achieve the thirty-six miles between Paddinghton and Reading in twenty-five minutes. This is a start-stop average speed of nearly ninety mph. Up to 125 mph running could be possible between Stockley Junction (for Heathrow) and Reading, as all trains will be 125 mph Class 800 trains. Up to 110 mph running xould be possible between Paddington and Stockley Junction, as some trains will be 100 mph Class 387 trains. Digital signalling and possible automatic train control, could run the all trains to a precise timetable. Class 800 trains that stop at Slough, could do this in a very fast time. I wouldn’t be surprised to see at least sixteen tph. Currently, the frequency is under ten tph. If this frequency is achievable or even bettered, then this would be an impressive high-capacity service. Currently,, Great Western Railway has forty-five Class 387 trains. Twelve are being modified, so they can run the Heathrow Express services. But what happens to the other thirty-three trains? Currently, some run a stopping service between Paddington and Didcot Parkway station, which stops West of Reading at Tilehurst, Pangbourne, Goring & Streatley and Cholsey stations, to give these stations a two tph service to Paddington. The service between Reading and Paddington may be replaced by Crossrail in the near future offering four tph in the Peak and two tph in the Off Peak. It looks like the dropping of electrification to Oxford and Bedwyn, which resulted in Great Western Railway ordering more Class 802 trains to replace the slower Class 387 trains has resulted in a simpler and faster operating philosophy for the trains between Reading and Paddington. All GWR services will be Class 800/801/802 trains, using the fast lines. All Crossrail services will be Class 345 trains, using the slow lines. All freight services will use the slow lines. Heathrow Express services will use the fast lines, which they will leave ande join at Stockley Junction. All fast line services will be non-stop. All passenger trains will be using the electrification on the route. It appears to be an efficient system, that keeps high-speed and stopping commuter services separate, whilst allowing 125 mph commuter services to be handled as high-speed services. If I’m right, that there may be extra capacity for more high-speed services into Paddington, it will allow GWR to run extra services. Everybody is looking for a scapegoat for the problems at Paddington station, that is reported in this article on the BBC, which is entitled Paddington Station: Passengers Face Major Disruption. Tony Miles of Modern Railways was on BBC Breakfast this morning and he explained what happened. The Class 802 train was accumulating the 2,000 miles it needs before it can be accepted by Great Western Railway. The trains are designed to be able to change from diesel to electric power and vice-versa at line speed. This train was raising the pantograph to access the pverhead wires on a section of British Rail-era overhead wires at Ealing. The pantograph is thought to have bounced and the overhead wires have broken and become entangled in the pantograph. Modern electrification with its heavyweight gantries has each line wired separately, but according to Tony Miles, the British Rail lightweight system, means if one comes down, they all fail. I should add, that several times in the last ten years on the East Coast Main and Great Eastern Main Lines, I have been on trains that have been stranded by failed overhead wires. In addition, over the last few years, it has been a nightmare travelling to Ipswich, as Network Rail have been renewing the overhead wires to a modern standard. There are still many miles of this sub-standard British Rail-era overhead wiring all over the country. It should all be replaced with new modern systems. There is a problem though with the new modern electrification systems. They are ugly and many believe they are totally out-of-place in the countryside. There is also the problem caused by the disruption, when the old systems are removed. This sub-standard overhead electrification should have been removed years ago. My excursion to Greenford was to get a detailed look at the Class 165 train that works the Greenford Branch. The trains are internally in reasonable condition. They have a Universal Access Toilet. This particular train had a large number of well-placed point points and USB sockets. The interior would not need much work to bring it up to a very good standard. The majority of the trains are moving to the Bristol area to provide local services including some longer distance ones to Cardiff, Exeter and Gloucester. If the initial conversion of a Chiltern Class 165 train to a hybrid train, that I wrote about in Class 165 Trains To Go Hybrid, is a successful conversion, I think there could be several reasons to look at converting Great Western Railways trains. The financial details will decide whether the conversion is worthwhile. I have travelled about six times on Class 800 trains on the Great Western Railway. I have not had any train-related problems and on every journey, the trains have arrived close to schedule. That even included an out-and-back trip to Swansea from Paddington on a Saturday. There doesn’t seem to be too many complaints or news stories on the Internet. Although, I do feel some passengers are missing the InterCity 125s and others talk of hard seats. 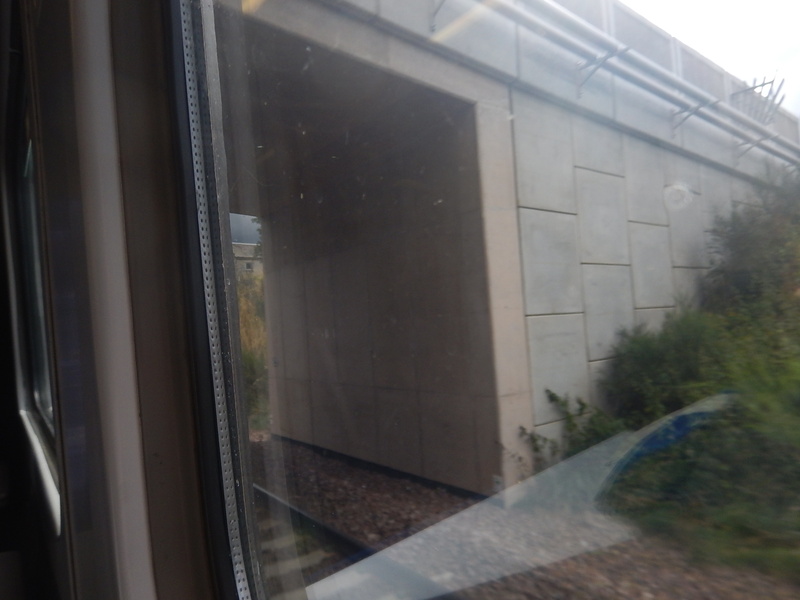 I would also not complain about the view from a window seat and I have found the trains to be a good camera platform. This article in Rail Magazine is entitled Does Great Western Railway’s Class 800 IET pass the test?. This is their main conclusion. They also say, that First Class is not worth the extra, whereas they felt it was was in the InterCity 125s.